........ you thought that I was lost, didn't you? ....... No. I wasn't. Busy, perhaps .... but not lost. Late autumn is upon us in the 'northland' ...... and the temp took a drop today. It has been unseasonably warm ....... but that is about to end. Winter preparations are almost complete as we anticipate the cold and snow that is soon to arrive. I'm digging through my yarn stash looking for some wool as I've been commissioned to knit a friend a pair of socks for her husband as a Christmas gift. 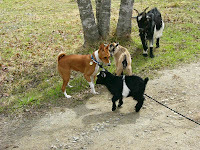 The picture above shows the pygmy goat kids meeting my Basenji during one of their first outings last spring. Can't wait till we move to a more rural setting so we can have some nubians. Love love love goats! Where does the time go????? ?